These awards are based on orders we received from our global customers, as such they represent a true global market snap-shot for commercial software components and development tools in 2017. 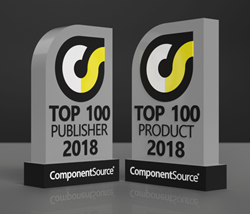 ComponentSource®, the world's largest marketplace and community for reusable software components and development tools today announced their latest Awards for 2018 for both leading publishers and their individual products. The awards have been given to the Top 100 Bestselling Publishers and the Top 100 Bestselling Products, based on the total sales dollar value of orders placed by customers during the year (2017) through ComponentSource worldwide.